Erected by Graham Historic District Commission. Location. 36° 4.097′ N, 79° 24.047′ W. Marker is in Graham, North Carolina, in Alamance County. Marker is at the intersection of South Main Street and Pine Street on South Main Street. Touch for map. Marker is at or near this postal address: 141 South Main Street, Graham NC 27253, United States of America. Touch for directions. Other nearby markers. At least 8 other markers are within walking distance of this marker. National Bank of Alamance (within shouting distance of this marker); Graham's First Bank (about 300 feet away, measured in a direct line); Alamance County Courthouse (about 500 feet away); Captain James W. White House (about 500 feet away); Alamance County Confederate Memorial (about 500 feet away); Vestal Hotel (about 600 feet away); Wrike Drug (about 700 feet away); Originally a Wing of the Union Hotel (about 700 feet away). Touch for a list and map of all markers in Graham. 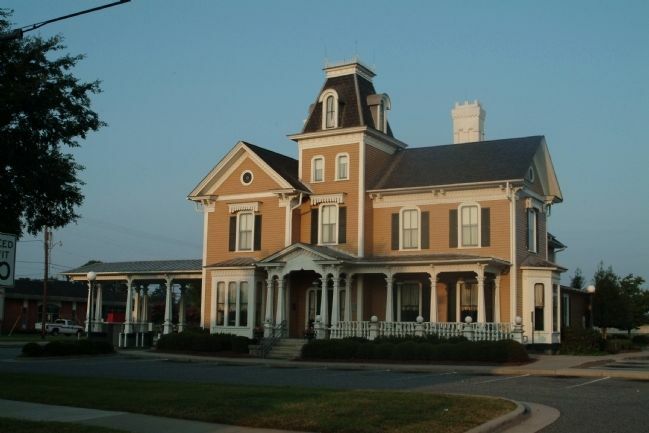 built this house in 1878, for his daughter, Mary Elizabeth Holt (1844 - 1935), and her husband, Captain James N. Williamson (1842 - 1921). Williamson was a commanding officer in the Confederate Infantry and the founder of Ossipee Textile Mill. McClure Funeral Home purchased the property in 1939, and remained in that location for many years. 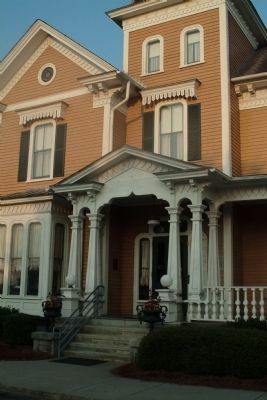 The house was purchased and renovated by Nationsbank in 1993. The drive-thru overhang attached to the left of the house was added at that time. The property is currently owned by Bank of America. The marker is to the left of the door. More. 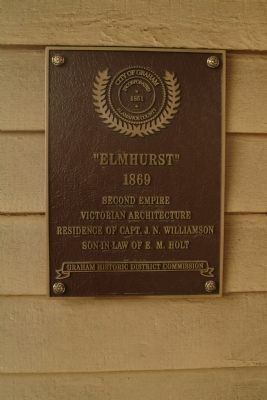 Search the internet for "Elmhurst". Credits. This page was last revised on June 16, 2016. This page originally submitted on August 29, 2010, by Paul Jordan of Burlington, N. C., U. S. A.. This page has been viewed 780 times since then and 7 times this year. Photos: 1, 2, 3. submitted on August 29, 2010, by Paul Jordan of Burlington, N. C., U. S. A.. • Bill Pfingsten was the editor who published this page.